← Legend of Fae Contest Prize. These are a few of the early sketches and ideas for some of the basic enemies in Valdis Story A.C. 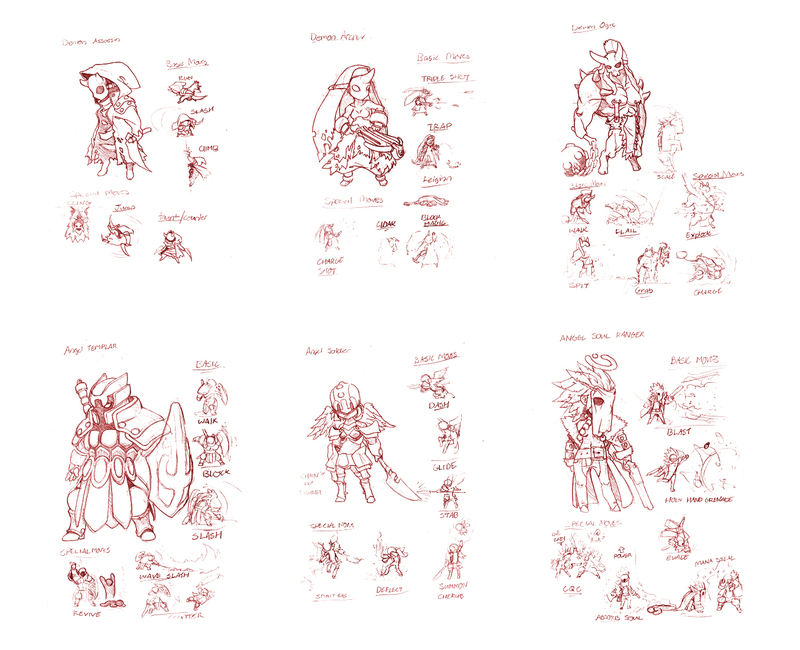 Most of them are recognizable as redesigns of the original Valdis Story enemies. These are some of the basic soldiers that fill out the ranks of the opposing Demonic and Angelic armies. I planned out a couple of abilities for each of them. The idea is that at the start of the game these enemies will only have a core set of their abilities, but as the game progresses more and more of their abilities become unlocked. This will allow the enemy combat skill to advance along with all the skills the player will gain through out the experience, giving the player opportunities to use every trick in their arsenal to counter the new tricks the enemies will pull out. I choose to design it like this rather then just keep giving the enemies loads more HP as the game progress because that only sort of adds an artificial difficulty. As far as the skills designed I tried to make them compliment each other in combat so that arranging different types and numbers of enemies could produce different battle experiences. For an example, the Templar is sort of the tanky hulk of the angelic Alagathian Army. When confronted with a number of enemies the logical strategy would be to pick off the smaller weaker ones before you go after the tank. So in order to give the player incentive to attack the Templar I gave him a resurrect ability that he can use occasionally on his fallen allies. Ignoring the Templar for too long could lead to you being overwhelmed. This entry was posted in Valdis Story and tagged game, new art, sketches, valdis story. Bookmark the permalink. I like the idea of added abilities rather than just more hp. Are you going to color code more difficult versions of the enemy or just leave them the same? Color palettes as well as other special effects will be used to display enemies possessing different elemental properties. Their skill level will not be visible at the moment unless I decide to slightly alter the weapons in their hands as an indicator.